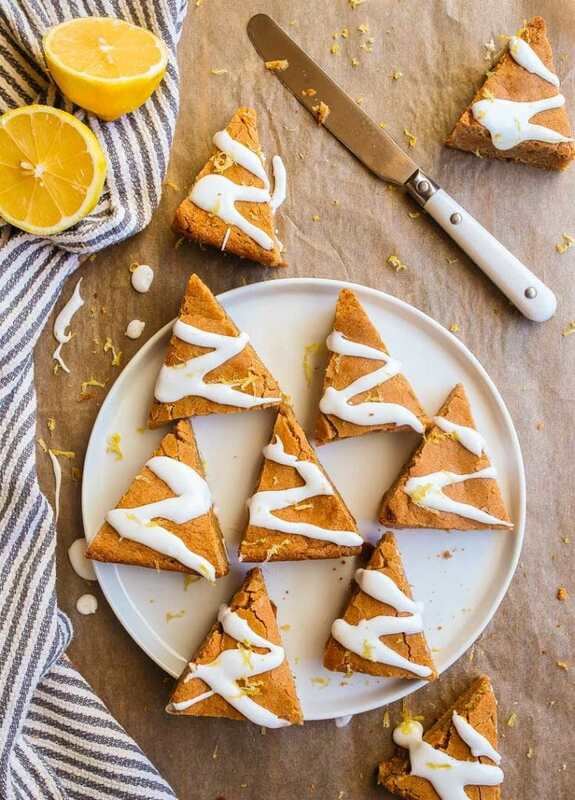 Gingerbread blondies with lemon glaze cut into Christmas tree shapes. This year, I only had enough energy to decorate one type of Christmas cookie. Luckily, it was my adorable Christmas Lights Cookies, and they impressed my kid so much that I think I could have phoned in the rest of the holiday baking. I also made these Gingerbread Cut-Outs with Cranberry Glaze (cuz Camille loves the pink color! ), my Christmas M&M Sugar Cookie Bars, and my Chocolate-Covered Cherry Fudge. I think that about covers it in the Christmas baking department. So now, I can focus on the other holiday stressors, right? Like, buying gifts, gift wrapping, mailing holiday cards, oh and also: we’re in the middle of moving. Did I tell you we close on our new house just a few days before Christmas? I’ve been stress baking a lot. A lot. My holiday season hasn’t included nearly enough gingerbread, and I knew I needed to remedy that. Gingerbread is the best holiday flavor in my opinion, and in years past, I’ve made gingerbread flan, a gingerbread latte, and a mini gingerbread loaf. This year, I’m all about these gingerbread blondies with lemon glaze. 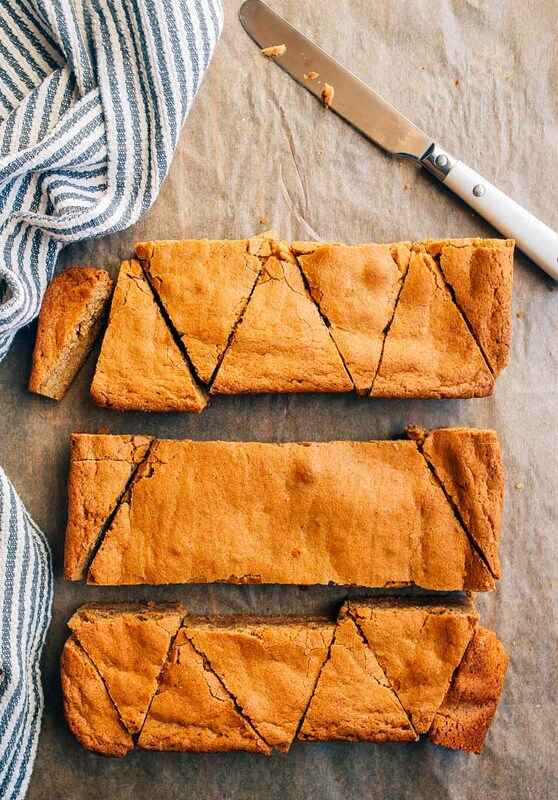 My small-batch blondies made in a 8×8″ pan are practically famous (you can always trust a non-chocolate lover to make incredible blondies), and with the addition of some gingerbread spices (ground ginger, allspice, nutmeg, and cloves), they’re even better. These remind me of my gooey chai bars, but slightly different with all the extra ginger and lemon glaze. 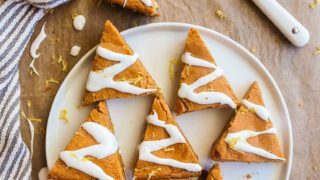 I could actually eat both: a chai bar in my left hand and a stack of gingerbread blondies with lemon glaze in my right hand, and alternate bites the rest of this holiday season. Are you in? I hope you don’t mind that these serve slightly more than two people. The recipe makes 15 little 3-bite Christmas tree shapes (see the photo above for help slicing them into perfect triangles); it’s still less than a big 9×13 tray of blondies but definitely more than two people can eat. I think they would make a great addition to a holiday cookie plate! Gingerbread Christmas trees with lemon icing. Preheat the oven to 350, and line an 8x8” baking dish with parchment paper (or foil) both ways (leave excess on one side to use as a handle for lifting out of the pan). In a microwave-safe bowl, melt the butter in 20 second increments. Next, stir in the brown sugar, vanilla and salt. Stir in the whole eggs and the egg yolk, and stir very well until incorporated. Finally, sprinkle the flour, spices and baking powder on top, and stir until well-mixed and no streaks of flour remain. Pour the blondie batter into the prepared pan, and bake it on the center rack of the oven for about 23 minutes, testing every few minutes after the 23 minute mark. Moist crumbs should cling to a toothpick inserted into the center, but you shouldn’t see any wet batter on the toothpick. Let cool in the pan for about 10 minutes, and then lift the blondies out and let them cool completely on a cooling rack. To slice the blondies into triangles, follow the photo above: slice into 3 long strips, slice off the ends and then alternate the angle of the knife to cut triangles. Once the blondies are completely cool, make the glaze by whisking together the powdered sugar, lemon juice and egg white. Resist the urge to add more liquid to make the glaze come together, just whisk slowly and it will all come together in a few minutes. Drizzle the icing across the triangles. Before the icing dries, sprinkle the lemon zest on top. This is genius!! Also why have I never thought about making a gingerbread flan. I’m Cuban! I should be on top of these things. I’m making that flan for noche Burma, I know it will be a hit! I’ve already made a batch and they were gobbled up by my three year old and husband so quickly!! Im planning on making a double batch for Christmas and was curious if you think they would freeze well? Such a great idea! I made the glaze but it was too runny. Is that a typo and supposed to read “2 cups” as opposed to “1/2 cups”? Yes, Alison! I’m sorry, it should 1 1/2 cups! I typed this recipe up half asleep and missed that. I’m so sorry! I’m making these now and noticed that there are a bunch of spices listed that aren’t mentioned in the instructions. I assume they should be whisked into the flour. If there’s a step I’m missing I hope someone will let me know. OMG these look so delish! And no I have not had enough sweets even though resolutions are supposed to start now. The tree light cookies are adorable too – just wish I saw them sooner. I get your posts and follow you on instagram…. so many things to love. I am going to order your books right now. It is rare that you see all good reviews on any item so I am confident they will be great! Merry Christmas to me. Thanks for all the great recipes and posts!